Be brave – beat burnout! We often talk about how brave you need to be to truly take a leadership position. It’s not easy. But businesses aspire to lead all the time. As they should. Often they have the resources to make a difference. But you need to be brave. In recent weeks, Kate Middleton (with help from her husband and his brother) has done an amazing job to help the ‘Heads Together’ charity cut through the news noise created by General Elections and diplomatic danger in Asia, and get people talking about mental health. It’s a campaign to admire for many reasons… Topical, difficult, personal and brave. In particular, I liked one of the hash-tags the campaign used: ‘oktosay’. Through all the coverage of ‘Heads Together’, the importance and difficulty attached to sharing problems and speaking about mental health was received loud and clear. Prince Harry’s disclosure about how he bottled up grief after his mother died was deeply moving. It reminded me of Rio Ferdinand’s equally moving BBC documentary about helping his children cope with their mother’s death, and helping himself to grieve the loss of his wife. In both cases the route through grief to some sense of healing was driven by communicating. ‘Oktosay’ is a great hash tag that really gets after this point using only seven characters. 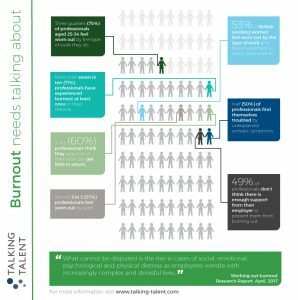 And there’s a direct link to work My Word Communications has been doing to help Talking Talent produce a report on the risk of burnout at work. Of course, it’s not the same as being bereaved of a loved one – not at all. But there is a link in the importance and difficulty attached to sharing problems and speaking about their impact for people. Talking Talent’s research, Working Out Burnout, tells us that three-quarters of professionals aged 25-34 already feel worn out by work. So, the threat of burnout is not reserved for middle age or later life. It is real and immediate. But a third of professionals would NOT feel comfortable reaching out to their employer when experiencing burnout. This rises to 42% for graduates. So businesses need to step up to a crucial cultural challenge. How can they give their people confidence that it is not a sign of weakness to start talking about burnout? Time to lead. Time to be brave. Make sure your employees know its ‘oktosay’!